Can the supersonic Boom jet beat the Concorde's economics? Ask a harried air traveler about the basics of modern flight, and you’ll probably elicit surprise when they discover commercial airplanes fly only as fast as they did in the 1950s. Given the range of aerospace advances in the past half-century, plus the technological leaps in almost every other area of human endeavour, it seems reasonable to ask: Why can’t we fly faster? That’s the question driving a startup called Boom Technology, which says it’s time to bring supersonic jet travel into the mainstream – in a modern way. The company is pursuing speed with an audacious idea: a 45-seat aircraft that cruises at Mach 2.2 (1,451 miles per hour), faster than the defunct Concorde and certainly faster than the standard 550 mph, with fares no more expensive than a current business-class round trip, which ranges between US$5,000 and US$10,000. Boom: coming to an airport near you? 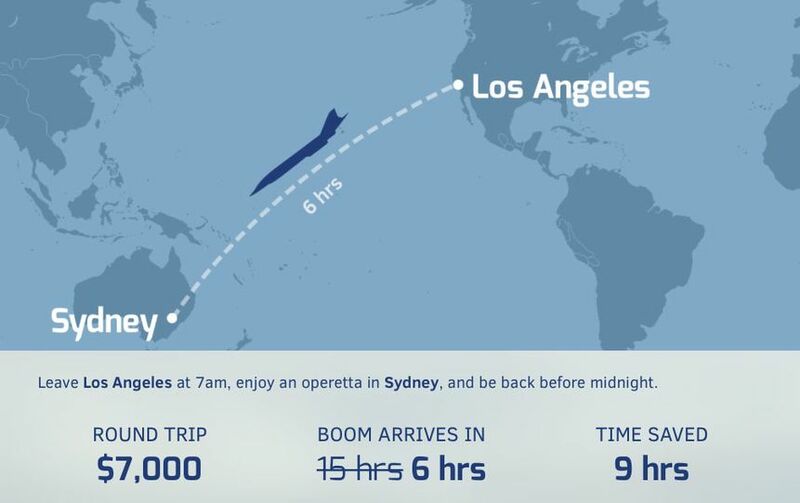 Yet long before travelers can marvel at a quick hop across the Atlantic, Boom will need to sell the airlines not just on a technically disruptive aircraft, but also on one that can accomplish such feats of velocity cost-effectively. It must earn a solid profit – no middling returns allowed – and this, of course, has been a key reason the Concorde was an aberration rather than the harbinger of universal supersonic travel. Boom is likely to encounter deep skepticism in a conservative industry that still relies heavily on a fundamental airplane design devised 70 years ago. The major global airlines Boom will court operate with two cardinal maxims: It’s really hard to make money with small airplanes, and it’s really, really hard to make money with supersonic airplanes, which are renowned for their fuel inefficiency. Boom will face a numerical gauntlet as it seeks to sell airlines on the advantages of a small, supersonic craft, with airlines posing tough questions about weight, range, fuel burn, maintenance, dispatch reliability, and dozens of other issues. The company also plans for its aircraft to fly on three engines, a departure from the industry trend of using two engines as the most efficient configuration. In response to skeptics, Boom touts its design as a radical update of the troubled Concorde, which was operated by only two airlines over 27 years. Airlines no longer abide such loud, kerosene-gulping equipment, which means new engine designs must be fuel-efficient and coupled with meager emissions and low noise. Boom has diagnosed Concorde’s operating flaws as twofold. First, the plane had ferociously high operating costs, driven primarily by its voracious appetite for jet fuel. “Grossly uneconomic,” in the words of a 1978 New York Times article summarizing critiques of the aircraft. Second, the Concorde’s load factors were generally lean because of the steep fares Air France and British Airways were forced to charge, typically around US$15,000 to US$20,000 in current dollars. Boom says it plans to address all of these shortcomings. The startup’s signature city pairing is New York to London, which would take a little more than three hours to fly and give a corporate traveler the opportunity to make a day trip across the pond and back. “Leave New York at 6 am, make afternoon and dinner meetings in London, and be home to tuck your kids into bed,” the suburban company says on its website. 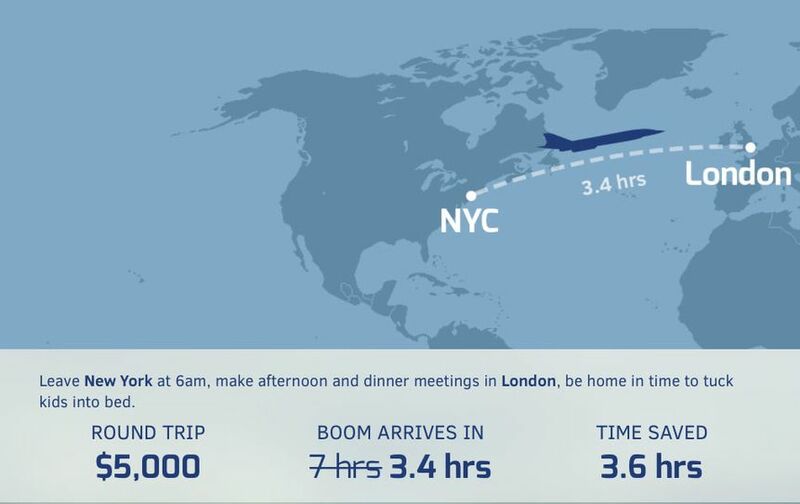 Fancy a sub-4 hour supersonic sprint between London and New York? “It’s about making the economics work and then delivering the aircraft we say we can deliver,” says Boom’s co-founder and c hief executive officer, Blake Scholl, a pilot and former app developer. Boom has struck a deal with the Spaceship Company, the manufacturing division of Richard Branson’s Virgin Galactic, to use that company’s engineering, design, and flight-test support services. Brandon's company also has options for Boom’s first 10 aircraft as part of the arrangement. Another unidentified European airline has taken options for 15 aircraft, Scholl says, and Boom is talking to carriers about options for an additional 170 aircraft. 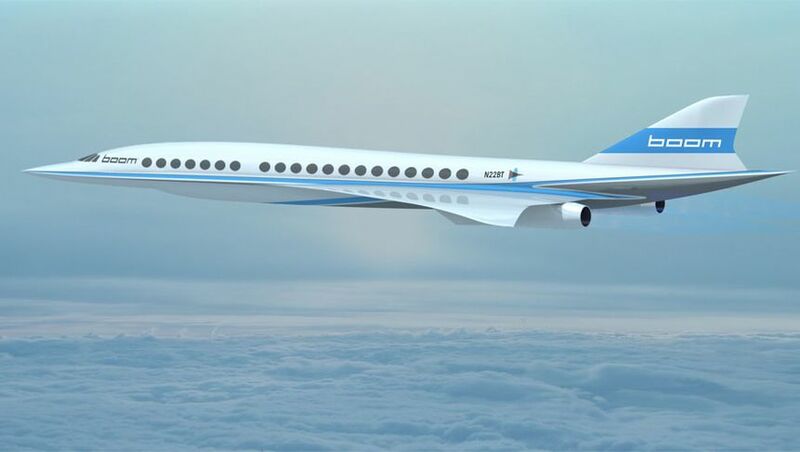 An analysis by Boyd Group International, an aviation consulting firm, suggested that Boom could sell 1,300 supersonic passenger jets over 10 years for a premium service on routes frequented by corporate traffic. 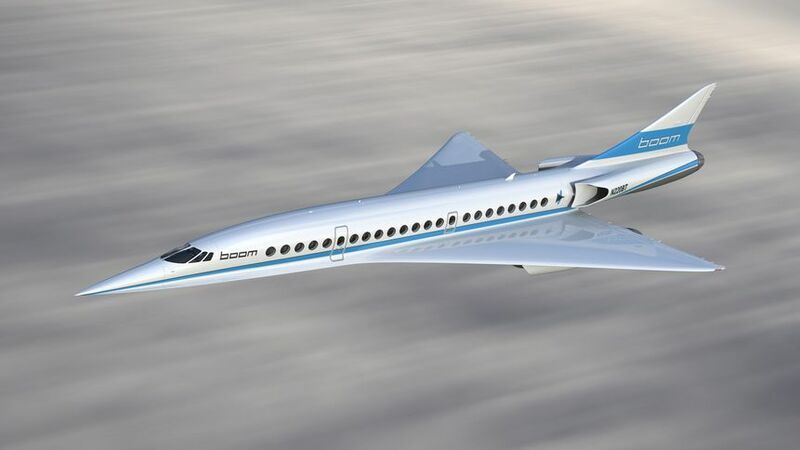 Boom’s aircraft would target such global business centers as Hong Kong, London, New York, Singapore, Sydney, and Tokyo, where corporate travelers would likely pay for the time savings a supersonic jet could afford. 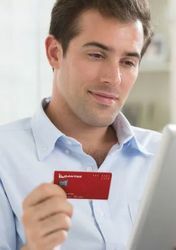 One potential tool to attract buyers will be the prospect of penalty payments, which are widely used by manufacturers to compensate customers if engines or aircraft fall short of guarantees. “If [airlines] were guaranteed the numbers, someone will try it,” says JetBlue’s St. George. The company will be forced to demonstrate that whatever positive performance data its models yield in computer simulations, the planes will hold up in the real and very brutal world of airline economics. That will require extensive flight testing so that Boom can move beyond the “paper airplane” stage, according to St. George. “You can do a lot of modeling with software these days before the thing flies … but until you actually see it, you never really know,” he says. Boom plans to fly a one-third-size demonstrator version of its airplane called the XB-1 in late 2017, working with General Electric. It’s aiming to initially fly GE’s J85 engines, a model that dates to the 1950s, on the XB-1. Flights will begin at subsonic speeds and then get progressively faster. Boom has hired Honeywell International Inc. for avionics and environmental control systems. The biggest technical challenge, however, will probably be the engine, as noted in a recent analysis by Bjorn Fehrm, an aerospace consultant and a former fighter pilot in the Swedish air force. Fehrm estimated that the Boom design is likely to use about three times the amount of fuel per seat-mile than current flights between London and New York. For development work on the production model’s engines, Boom is talking with “all the usual suspects,” Scholl says. The company plans to use a proven commercial engine core – the GEnx and Rolls Royce Trent 1000 power plants on Boeing’s 787 are among “multiple good options” – and then modify that engine’s turbofan and composite blades, he says. That approach will require regulatory certification as a new engine, which adds to the overall development cost. “In essence, you’re taking an engine that has a big fan and putting a medium-size fan on it that’s more appropriate” for the Boom design, Scholl says. Scholl declined to say how much research work an engine manufacturer would have to invest in this project, but the market is almost 4,000 engines, based on the Boyd analysis. Major engine makers would probably be drawn to a business that size. Beyond the engine performance, another issue for airlines would be how to market an upscale supersonic service alongside the premium cabins on existing jets, according to Alex Wilcox, CEO of JetSuite, a California-based charter service and scheduled airline. Would the Boom aircraft siphon off most or all of a carrier’s business- and first-class passengers? If so, what happens to that space on the current aircraft fleets? Being up in the air is fast becoming the same as being in the office, with robust internet communication a priority for carriers, thus reducing the biggest attraction of supersonic flight - speed. 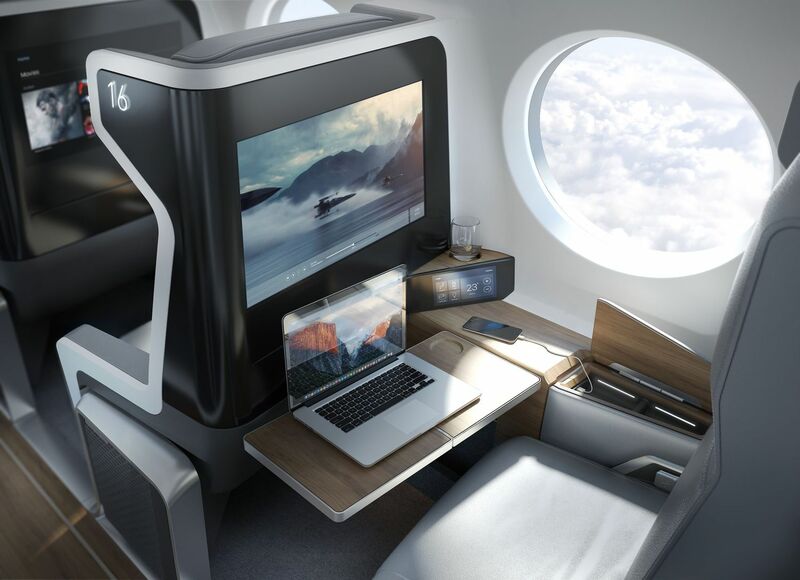 Mix that with the flat beds and premium dining, and the business-class cabin can become a comfortable den in which to be productive, rested, and well-fed on the kind of 15- to 20-hour flights that are quickly becoming routine. “You used to be stuck in a tube,” says Teal Group’s Aboulafia. “Now it’s an office in the sky. Everything has gotten way more comfortable.” Many people now flying for the better part of a day adopt a “Who cares?” attitude. Despite the challenges Boom faces, and they are many, aviation experts expect that at some point, years from now, the economic challenges of commercial supersonic travel will be overcome. Airlines chose 747 over Concorde. For two really good reasons. Booms and bums. What’s changed? The booms are much quieter now, and so legislation is going to (hopefully) become more reasonable. As for bums, the idea is Boom will become the new First Class. The jet is quite small and can deliver the seats you see in the picture at the same operating costs as contemporary full-aisle-access business class. 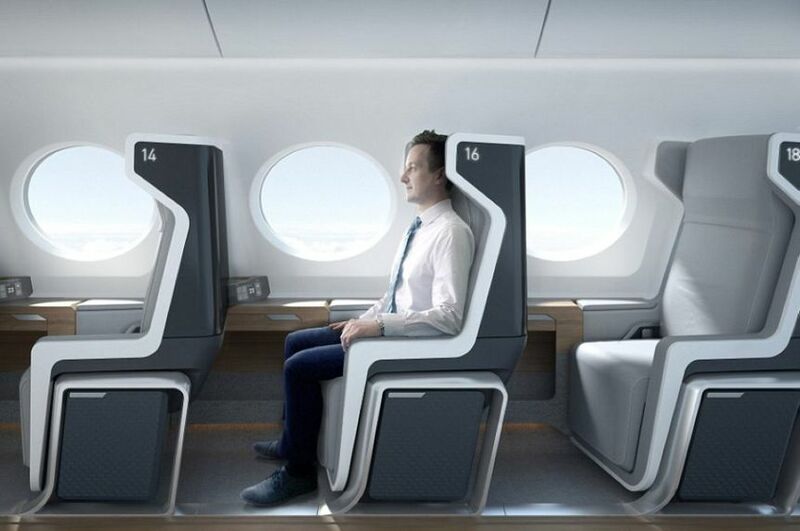 First Class of the ultra-luxe kind will become unnecessary if Boom is successful. Not a fan of these Bloomber articles. I agree...I'm not keen on all this pie in the sky stuff and as soon as I see them get names wrong such as 787-900 I just stop reading and close the article. Comment on "Can the supersonic Boom jet beat the Concorde's economics?"